This blog is usually filled with lots of lovely things about London. I talk about my weekly life living in the Capital and what I get up to and recommend. However if you heard me speak in real life, you’d find something a little off. I’m not actually a Londoner, but a proud Northerner. From a small town called Warrington, near Manchester to be precise. I don’t often go back up North, however I still have friends up there so usually for someone’s birthday it calls for us all to travel from every corner of Britain back to Manchester. Which is exactly why I found myself in the Northern capital. It was quite a rushed day as I came from London in the morning, so I decided to meet some of the girls for lunch in my hotel. I was staying at the MacDonald hotel right by Piccadilly station. 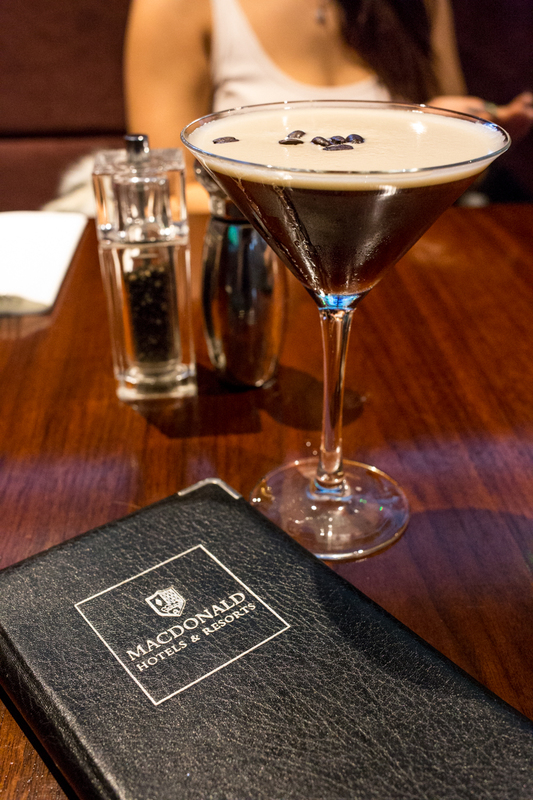 I’d booked us lunch in their Scottish Steakhouse restaurant although when I arrived there had been some confusion as the restaurant didn’t actually open till 5PM, however they have a large lounge bar area which serves lunch so all was not lost. One thing I will say though, was despite the confusion, how nice everyone was. Calm, attentive and it didn't seem like bother when they had to look into what had happened to my reservation. Sometimes in London, you are made to feel like you've done something wrong all the time, but not here. Customer is always right seems to stand. I was really in the mood for steak, so it was lucky that the bar still served steak even if there wasn’t quite the selection of the restaurant. 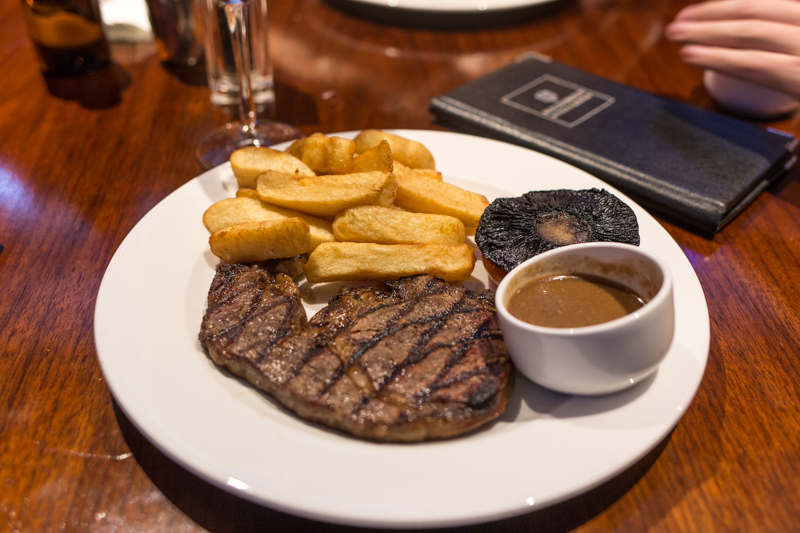 The bar food is more casual pub food than the restaurant, however the steak was still very nice with a good amount of fat on it, and the peppercorn sauce was a great addition. 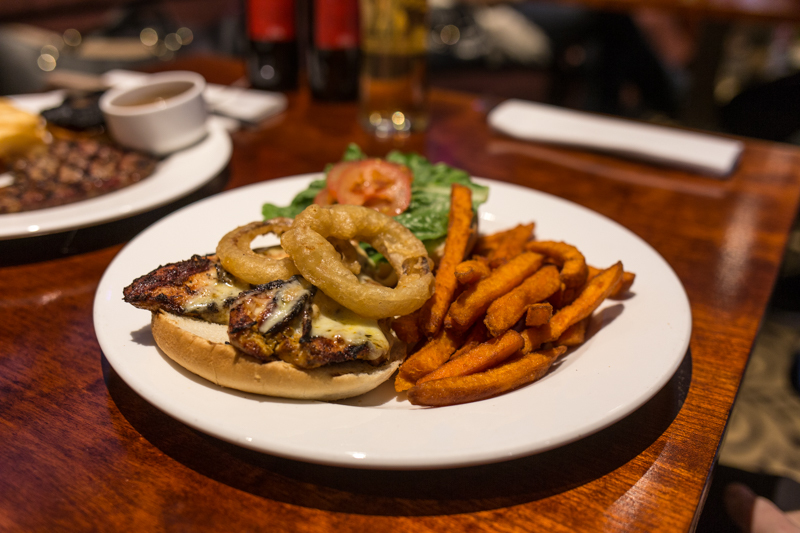 I love a good pub burger, especially chicken and cheese. It's the best combination in my eyes. A little BBQ sauce too maybe? We all looked at each other across the table, having the same thoughts. We all knew we had to get into our party dresses that evening yet the dessert menu looked tempting. It was a decision all girl’s face at some point. Dessert or outfit. Dessert or outfit. If you know me by now I think you’ll know which I chose. 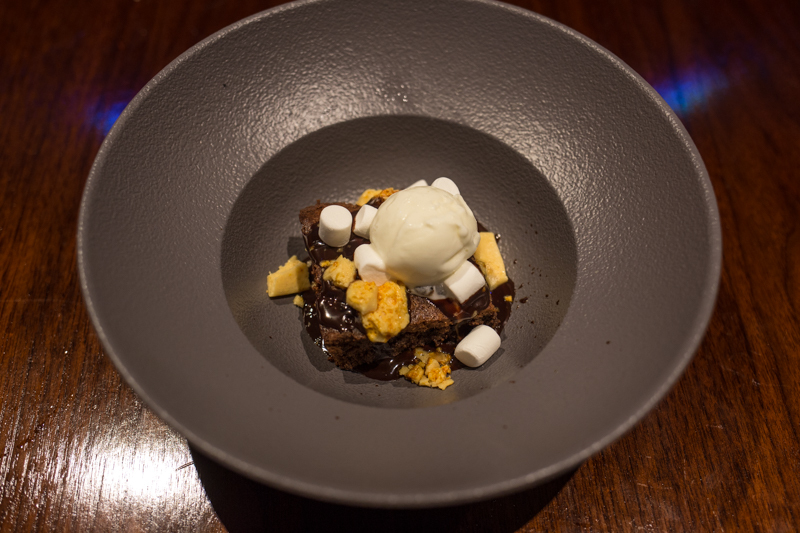 The salted caramel brownie with honeycomb and marshmallows was actually a big surprise. It was so delicious! I shared one but wished I got one to myself. Stuff the dress! We hadn’t seen each other for a while so it was great to catch up in such a relaxed atmosphere. However knowing what us girls are like, we soon realised we needed to start getting ready for dinner. So. Much. Food. Luckily I was only upstairs- maybe time for a quick nap? 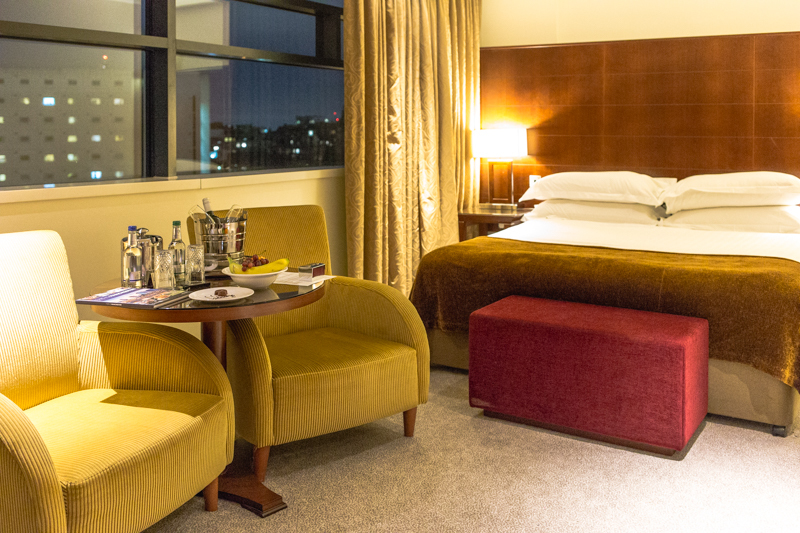 The deluxe room was a fantastic size for a city hotel, and it came with great views across the city. Soothly warm tones throughout were very inviting and after doing a quick bed jump test (my standard) I can confirm it was a good soft bed AND the pillows were that right happy medium between soft and hard. I hate overly soft pillows, but at the same time, no one wants rocks to put there head on. 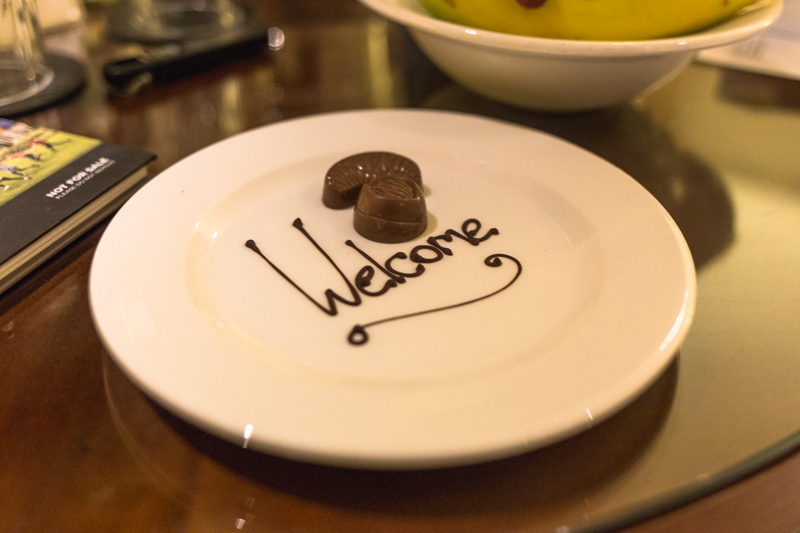 Personal touches were a lovely little extra, with some chocolates left out, fruit and even a hand wrote welcome sign. 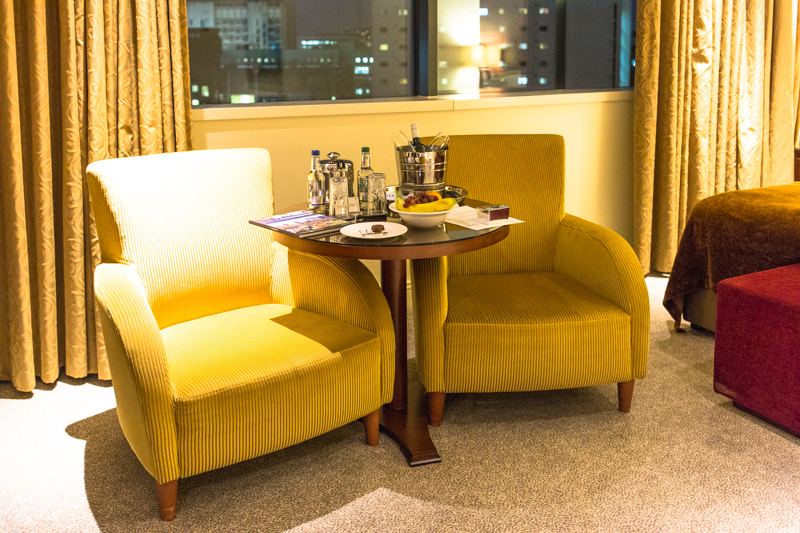 A quick shot of coffee (and maybe a chocolate or two), and it was a mad change into my party dress, and out into the night again. 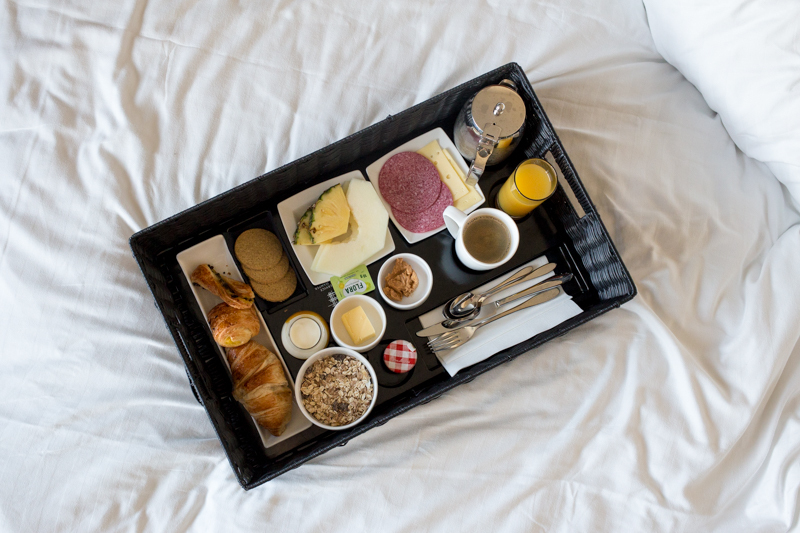 In the morning I was woken by my breakfast arriving. The MacDonald do a lovely continental hamper if you don't feel like making it down to the main dining room. Croissants, cheeses and coffee. That's all a girl really needs right? With no particular rush, it was great to just have a lazy morning in bed, grazing and picking at the food. I truly love London, but I know I'll always been a Northern gal at heart. There's just something about the North that is so warm and inviting, and no amount of fancy restaurants, cool bars and swish shopping in London can replace that. 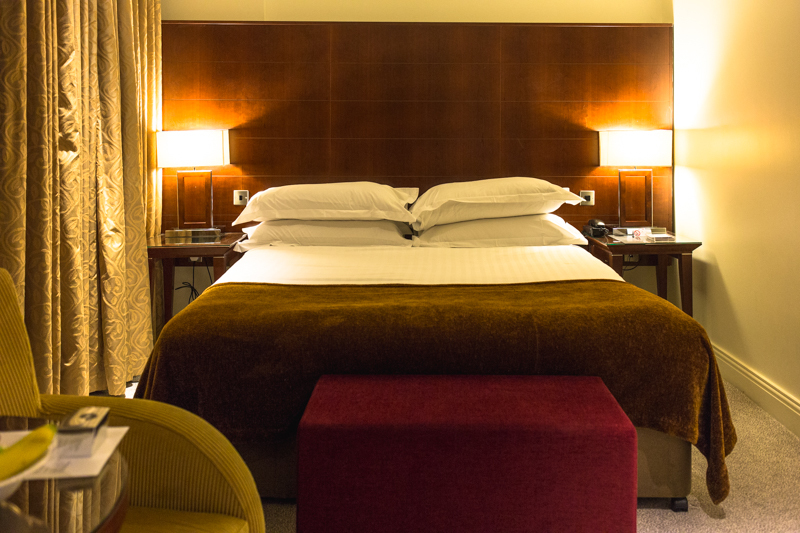 This looks like the most perfect hotel stay ever. The room looks amazing, and the attention to detail makes it so special. So glad you had a lovely time up north!